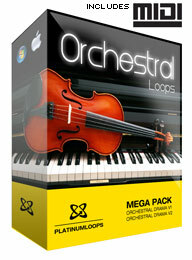 Orchestral Loops - Mega Pack 2, Other CD & Sound Bank from Platinum Loops. 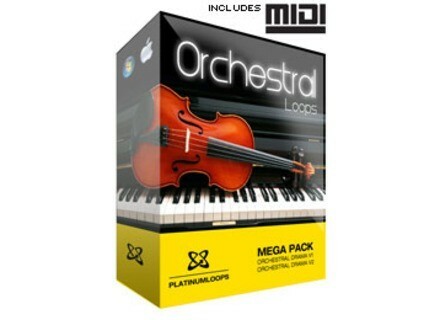 This product bundles together Orchestral Drama sample packs at a discounted price. It features 21 song construction kits with a total file size of 1861 Mb. Platinumloops Euphoria V1 - Intense Buildups This sample pack contains 170 loops in 24-bit stereo quality. Platinumloops Rhodes Riffs V2 Rhodes Riffs V2 brings you 10 song construction kits with riffs, chord sequences and melodic phrases. Platinum Orchestral Drama V2 It's time to take on the Big Screen. Your Epic project needs Epic sounds and these cinematic samples arrive in style.